Many yoga classes provide mats, which is fantastic if you’re just starting out. But after a while, you might get sick of resting your face into a stinky communal mat. 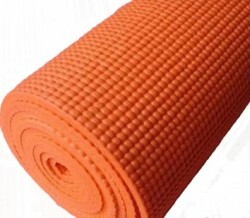 Here at Sinclairs Fitness, you can buy a yoga mat of your very own. I love the Bodybuilder Yoga Mat – it’s just $39.95. The Solid Focus Yoga Mat is also really popular – and a steal at just $23.95.